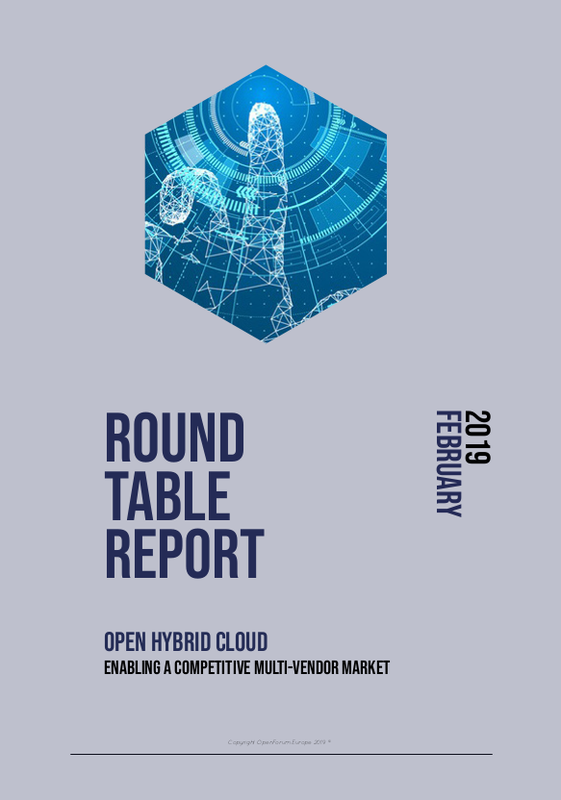 Round Table Report on ‘Open Hybrid Cloud – Enabling a competitive multi-vendor market’ prepared by OpenForum Europe (OFE) to summarise the speakers’ presentations and panel discussions which took place at the OFE Round Table organised on 28 February 2019. Cloud has matured from a buzzword to a fully realised operational reality. It can offer numerous advantages for those adopting cloud computing, such as reduced costs, greater flexibility, efficiency and security, especially in flexible ‘hybrid’ cloud environments. However, the lack of cloud interoperability is a barrier to cloud-computing uptake, because organisations fear vendor lock-in. Lock-in leads to the situation that once an organisation has selected a cloud provider, either it cannot move to another provider or it will incur a substantial cost in doing so; this is because either the economic or technical offer has become inadequate, or the vendor has ceased operations. A common mechanism for enabling interoperability is the use of open standards. In this round table event, we want to explore how open standards and interoperability can enable a competitive multi-vendor cloud market. Content on this site, made by OpenForum Europe, is licensed under a Creative Commons Attribution Share Alike 4.0 International License.